Romney at a “relief” rally this morning (AP). 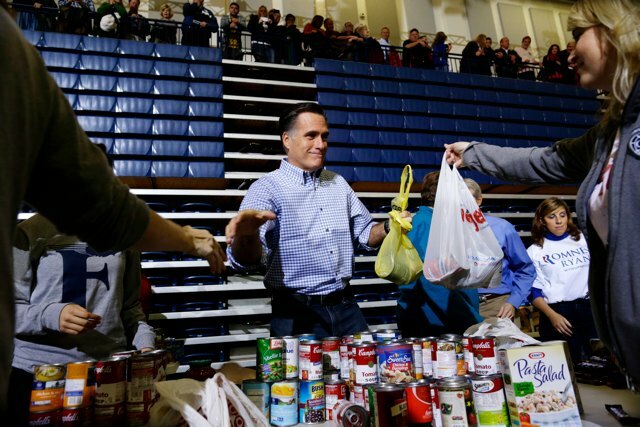 Hurricane Sandy is not turning into a political windfall for Republican presidential candidate Mitt Romney. Not only did Romney’s buddy New Jersey Governor Chris Christie go and call President Obama a “great leader” for his storm response but now some of the former Massachusetts governor’s previous statements about disaster relief are coming back to bite him. Not that he wants to talk about that when there is politicking to do. As the Times eloquently points out today, the Federal Emergency Management Agency (FEMA) has been pretty important to our response to Hurricane Sandy. And what do you know, last year Romney made it very clear he didn’t think FEMA needed to exist. Would he get rid of it? Still, campaign officials insist he would not abolish FEMA if he became president.